Eastern State Hospital provides recovery-focused, individualized inpatient acute care mental health services in a modern, comfortable setting. Managed by UK HealthCare, the state-owned facility opened in 2013. We provide acute psychiatric care for adults (age 18 and over) with severe and persistent mental illness who live in the 50 counties surrounding and including Fayette County, Ky.
Our staff promotes an individual’s recovery, wellness and transition to the community. Individuals are evaluated in our Admissions Department, and those who meet the legal criteria for hospitalization are admitted. We provide excellent mental healthcare that instills hope, inspires recovery and improves overall well-being for Kentuckians. Wellness in mind/body/spirit is attainable for everyone. Programs and classes are offered on the units as well as in our Recovery Mall, located on both the first and second floors of the hospital. The Recovery Mall is the hospital’s recovery and rehabilitation program. It’s an exciting, cheerful area designed to help people change, grow, and recover from the effects of mental illness and substance abuse. We also offer both music and art therapies that use hands-on experiences, along with therapist interaction, to improve mental, social, emotional and spiritual wellness. The original Eastern State Hospital opened in 1824 and cared for individuals for 189 years, making Eastern State Hospital the second oldest continuously operating psychiatric facility in the country. The previous facility is located on Newtown Pike and is now the site of Bluegrass Community and Technical College’s Newtown campus. Eastern State Hospital is managed by UK HealthCare through a contract with the Kentucky Department of Behavioral Health, Developmental and Intellectual Disabilities. The 300,000-square-foot Eastern State Hospital includes three three-story patient care towers – Allen, Gragg and Wendell. We operate up to seven acute care units of 27-28 beds each in a mix of private and semi-private rooms. View the first floor plan PDF. The Recovery Mall, where patients have the opportunity to participate in a variety of activities, is located on both the first and second floors. The first-floor Recovery Mall includes the gym/auditorium, the retail shop, beauty shop and library. The second-floor Recovery Mall features a crafts room, pottery equipment and a social activity area. Designed with a focus on convenience and safety, the patient care units have their own dining rooms, screened-in porches and laundry rooms. View the patient unit floor plan PDF. 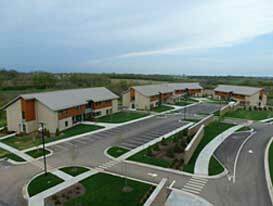 Located on the Eastern State Hospital campus, the Central Kentucky Recovery Center consists of personal care homes that offer less restrictive care that promotes residents’ return to a community setting. We’re located at 1350 Bull Lea Road in Lexington, off Newtown Pike and Citation Boulevard, on UK’s Coldstream Research Campus. You can reach us at 859-246-8000.